This is a presentation given on 29 April, 2010, at the Link-Age / LifeSpan Workshop on Data Handling for Biogerontology Research held by CISBAN, Newcastle University. Data integration: one definition is to combine data residing in different sources providing users a unified view of these data. Questions of relevance for the data integration field: scope (all, datasets), type (same, different), implementation (federation, centralisation), access (programmatic i.e. computer to computer, web i.e. interactive) and ownership (public, private). Henning covers federated, mainly programmatic techniques using data of the same type in this talk. To take an example, if you start with a sample (e.g. from a mouse). Observations of this sample results in one or more (overlapping or non-overlapping) publications. Then, the publication information can be used to annotate interaction databases and sent to PSICQUIC servers. PSICQUIC should allow the user to reconstruct an idealised view of the original system from the interaction data. The PSI-MI XML format is full featured, but complex. This complexity is both its strength and its weakness. Therefore, due to user request, they developed a simplified tabular format called MITAB where one row equals one binary interaction. You loose a lot of information, such as whether a binary interaction is part of a more complex reaction, but it has proven popular. PSICQUIC is one API which is implemented by many databases such as those mentioned earlier. Its purpose is for querying molecular interaction databases, and uses a common query language (MIQL, which is based on Lucene) for this data. Can be used for PPIs, drug-target interactions and simplified pathway data. The simple PSICQUIC viewer is at http://www.ebi.ac.uk/Tools/webservices/psicquic/view. The PSICQUIC viewer can also point to other resources such as IntAct and many other non-EBI databases. The viewer also has a more fancy, graphics-based implementation where there is an overlay of molecular interactions on Reactome pathways. MIQL can query every field available within MITAB in a precise way. SOAP and REST interfaces are available and documented at http://code.google.com/p/psicquic. The challenge is to move PSICQUIC from simple access to all the resources to a real integrated view of all those resources. How to determine if two sources really are talking about the same interaction? Also, the compute time quickly moves beyond suitable interactive times. PSICQUIC is a technical solution, whereas IMEx is the social/collaborative answer. IMEx is the International Molecular Exchange Consortium. The aims of its members include: avoiding redundant curation, providing a consistent body of public data using detailed joint curation guidelines, and providing a network of stable and comprehensive resources for MI data. This work is now in production phase since February 2010. The work is split up into the different databases by journal type. You can find out more information about IMEx at http://imex.sf.net. 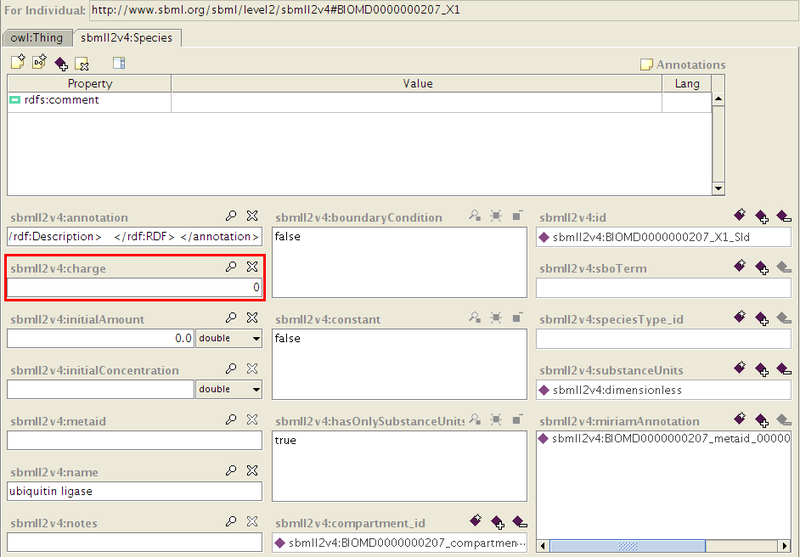 Each interaction has its own database’s identifier, but also an identifier from a common IMEx identifier space. The hardest part was harmonizing curation procedures, and they now have a common curation manual across all databases. Looking at another aspect of his work, EnCore, which is based on different data types integrated using a federated, programmatic approach. EnCore is an ENFIN platform to enable mining data across various domains, sources, formats and types. It integrates database resources and analysis tools across different disciplines. The first focus is on developing an EnXML format. Access interfaces include Perl API, Java API, ftp, SOAP, REST, GUI, etc. The return formats are in a variety of flavours, e.g. XML, CSV, plain text, JSON, etc. All of this must be squeezed into one consistent format. This is done by putting wrappers around the various programs. The EnXML structure is set oriented – not only does it tell you about one thing (e.g. protein), but also about a set of them. In this structure, an experiment is run which identifies the results. Each experiment references a Set structure, which contains the structure of the result. Sets can hold further nested sets. There are a number of other further sub-structures. The EnCORE results always include both a positive and negative result set (in the case of the negative result, it lists all identifiers for which *no* hit was found). Negative results allow you to track why you might not have gotten a response, and how you “lost” some identifiers from the result. 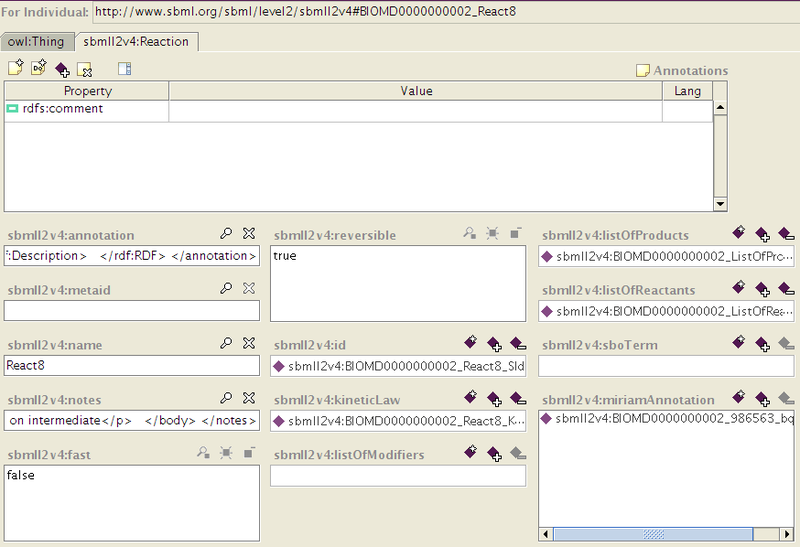 EnVision is an end-user tool for the above EnCORE work based on the EnXML format. It provides an initial, integrative view for Sets of molecular entities without the need for programming. It also allows the possibility for further local processing. It allows you to save the status/analysis of your material on a particular date, and use that for, e.g., supplementary materials. You can also download your sub-results in a tabular format. Further information and the ability to run this GUI is available from http://www.enfin.org, where you can play with an EnCORE tutorial. All of this can be quite laborious – web services that are used by EnCORE can change without warning, so it’s a constant challenge to maintain all of these wrappers. A partial answer is to use, wherever possible, underlying standards for the individual services. Such standards include PSICQUIC for MI data. DAS will be used to access protein annotation and information. There are a few big questions that need to be kept firmly in mind when starting down the road of ontology building. These are questions of: goals (What are you trying to achieve with this ontology? ), competency/scope (What are you trying to describe? ), and granularity (to what depth will you need to go?). The rest of this post relates directly to and is organised around these three topics. These topics have a lot of overlap, and aren’t intended to be mutually exclusive: they’re just ideas to get the brain going. I use the upcoming Cell Behavior Ontology (CBO) workshop to illustrate the points. Goals: What are you trying to achieve with this ontology? Competency/Scope: What are you trying to describe? Granularity: To what depth will you need to go? The rest of this post relates directly to and is organised around these three topics. These topics have a lot of overlap, and aren’t intended to be mutually exclusive: they’re just ideas to get the brain going. I use the upcoming Cell Behavior Ontology (CBO) workshop to illustrate the points. The questions I single out below may already have been answered by the workshop organizers, but haven’t been published on the CBO wiki yet. I’ll be attending this workshop, and will aim to post my notes each day. It should be fun! If a main goal is eventual incorporation within another ontology (e.g. Gene Ontology (GO) for the case of CBO) or even just alignment with the other ontology’s tenets, you have to be sure you’re happy with the limitations this may put on your own ontology. It may be that these limitations are not acceptable, and as a result you choose to reduce the dependencies on the other ontologies. Question: Do you wish to ultimately include some CBO terms under, for example, biological processes of GO? GO contains only canonical/non-pathological terms. How does this fit with the goals of CBO? GO has the express intent of creating terms covering only canonical / non-pathological biology. Therefore, would cell behavior during cancer (e.g. uncontrolled cell proliferation or metastatis, which aren’t in GO) be appropriate if CBO is meant to, in its entirety, be included within GO? They are important terms, so if some amount of incorporation with GO is appropriate, would it only end up being a partial alignment? Question: Are there any plans to use an Upper Level Ontology (ULO) such as the OBO Foundry-recommended BFO? Though BFO may not need to be considered immediately, it does place certain restrictions on an ontology. Are you happy with those restrictions? One example of the restrictions placed by the use of BFO is that within BFO, qualities cannot be linked via the Relations Ontology to processes. That is, if you have a property called has_rate which is a child property of “bears”, then you are not allowed to make a statement such as “cell division has_rate some_rate”, where cell division is a process, and some_rate is a quality. There is a good post available about ULOs by Phil Lord. Question: How richly do we want to describe cell behaviors? Another important general goal is the level of richness that is needed with CBO. Competency questions, discussed later, will answer this to some extent. We can think about richness using GO as an example. The goal of the GO developers is the integration of multiple resources through the use of shared terms. GO does this very well. But, if you want rich descriptions and semantic interoperability, then this is something that is not a goal of GO. While it is often a tempting idea to start from the top of an ontology and work downward, consideration should be given to an initial listing of leaf terms that you are sure that you need in the ontology. Not only does this ensure you have terms that people need from the start, the bagging and grouping exercises you would then go through to create the hierarchy will often highlight any potential problems with your expected hierarchy. If you have clear use-cases, then a bottom-up approach, at least in the early stages, can be useful in figuring out what the scope of your ontology is. This brings us to the importance of having scope – and a set of competency questions – ready from the beginning of ontology development. What do you want to describe? Question: What is the definition of cell behavior in the context of CBO? For instance, for CBO, what is meant by the word “behavior”? A specific description of what is, and isn’t, a behavior that the CBO is interested in, is an important first step. Question: Should the terms be biological terms only, or also bioinformatics/clinical terms? To better explain the above question, you could consider the stages of cancer progression. “Stage 2” is a fictitious name for a clinical/bioinformatics description of a stage of a cancer. This is not a biological term. Which type of term should go into CBO? I would guess that the biological term should go in which describes the biology of a cell at “stage 2”, and then perhaps use synonyms to link to bioinformatics/clinical terms. There probably shouldn’t be a mix of the two types of terms as the primary labels. Additionally, competency questions can help determine the scope. You can make a list of descriptive sentences that you want the ontology to be able to describe, such as “The behavior of asymmetric division (e.g. stem cell division)”. By listing a number of such sentences, you can determine which are out of scope and which must be included, thus building up a clear definition of the scope. For me the granularity question has two aspects: first, and more generally, is how fine-grained do you want to be with your terms; second, and more interestingly, is in the context of CBO, are we interested in the behavior of cells and/or the behavior in cells? The examples given in the workshop material seem to come from both of these areas (see http://cbo.compucell3d.org/index.php/Breakout_Session_Groups). Question: Should CBO deal with the behavior OF cells and/or the behavior IN cells? For the above question we can use as examples cell polarization and cell movement. Both are listed in the link to the wiki provided just above, so both are considered within the scope of CBO. However, cell movement is a characteristic behavior of a cell, while polarization is something that happens in a cell (e.g. polarization within a S.cerevisiae cell with regards to the budscar). Both of these types of behaviors are relevant, but they are different classes of behavior and may be an appropriate separation within the CBO hierarchy. As an aside, is cell division a behavior? It is covered in the CBO material, so with respect to CBO, it is. I think that the CBO is intended to deal with single cells, so I’m not sure where cell division fits in. These questions should be considered, but you should also try not to let them reduce the effectiveness and efficiency of ontology development. However, as with many biological domains, try to ensure that everyone is on the same page with their goals, scope, and granularity and there will be (I believe!) fewer arguments and more results. Also, I am positive I’ve missed stuff out, so please add your suggestions in the comments! With special thanks to Phil Lord for the useful discussions surrounding ontology building that formed the basis for this post. BBSRC Systems Biology Grantholder Workshop, University of Nottingham, 16 December 2008. Amanda Greenall: Telomere binding proteins are conserved between yeat and higher eukaryotes. The capping proteins are very important, because they prevent the telomeres from being recognized as double-strand breaks. They work on cdc13, which is the functional homologue of POT1 in humans. A point mutation cdc13-1 allows them to study telomere uncapping. When grown above 27 degrees Celcius, the cdc13-1 protein becomes non-functional, and fall off. This uncapping causes telomere loss and cell-cycle arrest. So, they do further study into the checkpoint response that happens when telomeres are uncapped. Yeast is a good model, as many of the proteins involved in humans have direct analogs in yeast. They did a series of transcriptomics experiments to determine how gene expression is affected when telomeres are uncapped. They did 30 arrays, and the data was analysed using limma. 647 differentially-expressed genes were identified (418 upregulated (carbohydrate metabolism, energy generation, response to OS), and 229 downregulated (amino acid and ribosome biogenesis, RNA metabolism, etc)). The number of differentially-expressed genes increase with time. For example, 259 of the genes were involved in DNA damage response. They became quite interested in BNA2, which is an enzyme which catalyses de novo NAD+ biosynthesis. Why is it upregulated? It seems over-expression of BNA2 enhances survival of cdc13-1 strains (using spot tests). Nicotinamide biosynthetic genes are altered when telomeres are uncapped in yeast and humans. The second screen was a robotic screen to identify ExoX and/or pathways affecting responses to telomere uncapping. Robots were used to to large-scale screens that can measure systematic cdc13-1 genetic interactions. One of the tests was the up-down assay, which allows them to distinguish Exo1-like and Rad9-like suppressors. Carry on with the spot tests until have worked through the entire library of strains. Darren Wilkinson: a discrete stochastic kinetic model has been built to model the cellular response to uncapping. (J Royal Soc Interface, 4(12):73-90), and in Biomodels. Encoded in SBML and simulated in BASIS (web-based simulation engine). You can use the microarray data to infer networks of interactions. Such top-down modelling can often be done with Dynamic Bayesian Networks (DBNs) for discretised data and sparse Dynamic Linear Models (DLMs) for (normalized) continuous data. A special case of DLM is the sparse vector auto-regressive model of order 1, known as the sparse VAR(1) model, and this appears to be effective for uncovering dynamic network interactions (see Opgen-Rhein and Strimmer, 2007). They use a simple version of this model. They use a RJ-MCMC algorithm to explore both graphical structure and model parameters. When the RJ-MCMC is performed, it's quite hard to visualize. They do a plot of the marginal probability that an edge exists. This can also be summarised by choosing an arbitrary threshold and then plotting the resulting network. You can change the thickness of the edges so they match the marginal probability associated with each edge. This picture is then easier for biologists to analyse, and allows them to narrow down their search for important genes. He also performed analysis over the robotic genetic screens. There are usually about 1000 images per experiment, each with 384 spots, and therefore image analysis needs to be automated. Want to pick out those strains that are genetically interacting with the query mutation. For interactions to be useful concept in practice, you need the networks to be sparse. With HTP data, we have sufficient data to be able to re-scale the data in order to enforce this sparsity. A scatter-plot of double against single will show them all lying along a straight line (under a model of genetic independence). Points above and below the regression line are phenotypic enhancers and suppressors, respectively. BBSRC Systems Biology Grantholder Workshop, University of Nottingham, 15 December 2008. This is the third BBSRC grantholders' workshop for systems biology. The participants include grantholders and their staff; people connected with the activities of the 6 SB centres; guests from BBSRC-sponsored institutes; guests from outside of these institutes; and finally, members of the BBSRC peer-review panels. Why is this workshop happening? It's an opportunity for sponsors and participants to discover and say how things are going; also interested in everyone sharing experiences with colleagues; and, of course, to talk about new ways to solve biological problems. I'll be providing my notes on most of the talks that are given over the next few days. Now for my notes on the updates from the directors of the six Centres for Integrated Systems Biology (CISBs). CISBAN (Tom Kirkwood): Why and how do we age? Limited investment in cell maintenance (the disposable soma theory). Ageing is caused primarily by damage, and longevity is regulated by resistance and repair. There are multiple mechanisms: it is a highly complex system which is inherently stochastic. There are a number of interesting questions that revolve around optimality, plasticity, and trade-offs. Now involved as an academic partner in the EU network of excellence, LifeSpan. One area of major research within CISBAN is that of telomere length homeostasis. Work includes high-throughput (HT) yeast robot experiments, which has led to the identification of a large number of genes that affect telomere maintenance. CISBAN also studies the intrinsic ageing of mammalian cells, where there is considerable cell-to-cell heterogeneity. Research has shown that it is much more than just telomere erosion: there is significant crosstalk between telomere and, for example, mitochondrial dysfunction. He also gave an overview of BASIS, a web application that allows the researcher to upload SBML models and run simulations on the BASIS server. There is a large amount of research going on within CISBAN that has a statistical focus, and there is also work going on with respect to data integration. CISBIC (Brian Robertson): CISBIC focuses on host-pathogen interactions, and contains 3 exemplar sub-projects. They have core facilities in glycoproteomics, metabolomics, transcriptomics and cell imaging. They are interested in combating disease in both plants and animals. They use infection as a perturbation to study host biology, mainly focusing on the interaction between the microbe and the innate immune response. They have tried very hard to create a community of systems biologists, and also have collaborations with people outside the centre. Top questions from experimental biologists: "How do I start in SB? ", "How do I start modelling? ", "Which modelling approach should I take?". They're considering starting a summer school to train people. CPIB (Charlie Hodgman): Began with a nice screencast/automated slideshow of pictures and work going on at CPIB. Main research works on plant roots, and how they respond to external stimuli. The research program is split into 4 strands: root cell elongation, root apical meristem, lateral root development, and an integrated root model. Models they are developing include: static and dynamic network modelling, biomechanical modelling, tissue-scale computational modelling, and more. Technological developments include vertical-stage confocal imaging, automated focusing time-lapse microscopy. Outreach work includes: advanced hormone-transport workshop in May 2008, and had their first plant modelling summer school in September 2008. In December 2007 there had a Maths and Plant Sciences Study Group. CSBE (Igor Goryanin): This centre is focused on dynamic biological systems rather than on any particular biological project. They are concentrating on cell-to-cell interactions, and their main aim is to streamline the modelling process. Mentioned the Bio-PEPA Eclipse Plug-in, which can run simulations within Eclipse. MCISB (Hans Westerhoff): Focus on one project, using S. cerevisiae: they want to make SB work, in a complete sense. This means from the individual sequences right up to modelling a complete cell. OCISB (Judy Armitage): Their remit is to build upon the strengths of groups within Oxford to provide a focus for the catalytic development of a wide range of systems approaches. They were trying to understand, predic ad control physiological behaviour by integrating knowledge of interactions at the molecular, cellular and population levels. Their initial core testbeds are: bacterial chemotaxis and sensory transduction, cell cycle, hypoxia and the Trypanosome flagellum. New projects include: plant metabolomics and signalling, extracellular matrix, t-cell signalling, diversity of host responses in malarial infection, meiosis, biofilm development and synthetic signaling networks. They're also doing more work in outreach, including open seminar series and one-day workshops. Scientist Meets Small Children, and doesn’t stop talking (and listening) all day! This past Monday, one day before fantastic things happened in the voting booths of America (I had already submitted my absentee ballot), I spent a day at a local primary school. Names and locations for the school will not be mentioned, as I am unsure about rules regarding child protection, but the day was great, and I’ll tell you all about that. I had contacted the Teacher Scientist Network (information about volunteering is at the end of the post), which pairs teachers with scientists, about a year or so ago. As far as I know, prior to me, most of the scientists who had volunteered had been wet-lab-based scientists, and the partnerships were generally geared around that sort of work. I am a bioinformatician/computational biologist, which means I spend all my work time in front of a computer. Figuring out what to do with me in the TSN, and who to pair me with, took some effort. However, with the wonderful help of people like Deborah Herridge, and now Claire Willis, from the TSN, I was eventually paired with a teacher. She has a biology background, and now teacher 10-11 year olds. So, she is very aware of what sort of science she wants the kids to learn, and also understands how important it is for kids to interact with a “real” scientist. And what she organized for my visit was just great. Words like funny, wonderful, crazy, surprising, cute, interesting, intelligent, curious, shy, proud, and many others come to my mind when I think of those kids, and I’ll try to explain why. My teacher partner has organized all this week as the school’s Science Week. And, for the first day, I was to visit and give them all a talk or two, and answer questions, about 1) what it is like being a scientist, and 2) what genes are and how they are used in research and medicine. In the case of the older kids, I also was able to talk a little about ethics, which was really good. I saw 9 separate classes, speaking at each one, and also gave a short talk at the two assemblies (one for the juniors, and one for the infants). The ages of the children ranged from 5 to 11. In my short talk I had prepared some slides about how I had become a scientist, and the longer talk centered around the theme that me and my teacher partner had decided on: genes, and how they are used in scientific research. Yes, this meant talking about “GM”, but there are so many aspects of it that the media never really touch on, that the talk was wonderfully diverse. 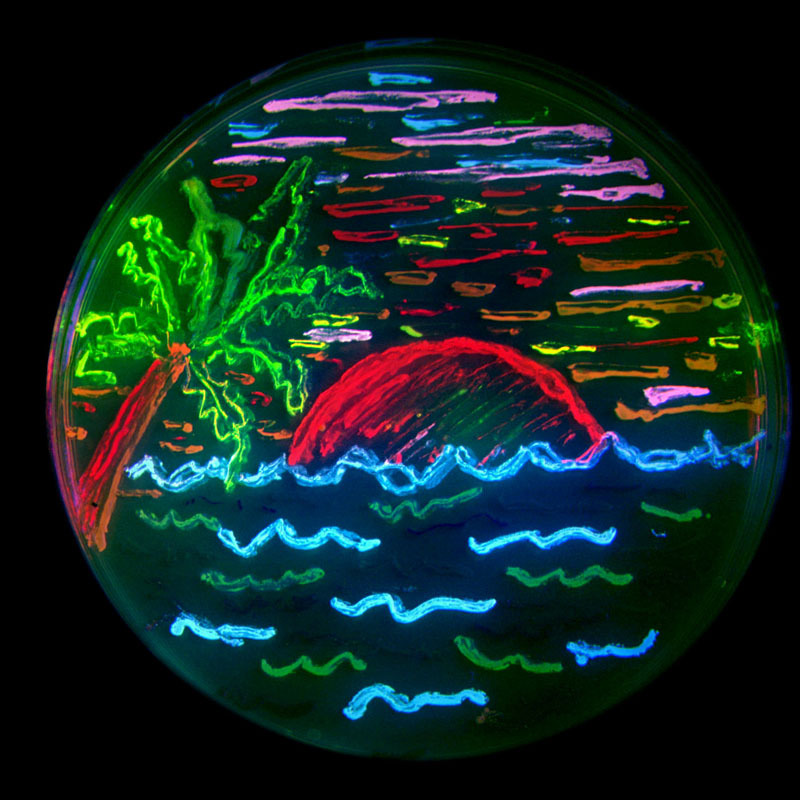 I spoke on historical domestication of animals, making medicine for humans, encouraging hardier crops, the similarities and differences between lab-based genetic manipulation and “traditional” selective breeding, the obligatory glowing fish and glowing mice, and the Nobel Laureates in Chemistry for this year, one of whom released a picture of a petri dish of fluorescing bacteria “drawn” with the picture of a sunset. By the end of the day, my throat was sore from talking. People who know me would not be surprised to hear I talked a lot – that’s a standing joke. However, the kids talked (in a good way!) almost as much as I did. They always wanted to tell me about their experiences, and how they related to the slides, and were full of interesting questions. It was fabulous. 1. Why do scientists wear white coats? 3. Can scientists mix more than one gene together? 6. Do you like America? / Do you like America more than the UK? 10. Is the science in CSI (the TV program) like real science? As you can see, not all of them were strictly on-topic, but they just kept asking question after question. They also did the classic kid trick of raising their hand as if to ask a question, when their real purpose was telling you all about their vacation/pet dog/pet hamster/pet cat/Uncle who used to be a scientist but now works at Asda (yes, really!). But I didn’t mind those at all. I kept on running over time in each classroom, as they had so many things to ask me. It didn’t matter what age – pitch the talk in the right way, and they really seemed to enjoy it! 1. My method of using no text on the vast majority of the slides really worked. It was especially useful as it meant I could stop anywhere in my slides if I was running out of time, and the littlest ones were not distracted by trying to read the words rather than listening to me. 2. Pictures of fluffy, pretty, cute, or “gross” animals were very, very popular. The number of “Awwwws” I got when showing pictures of cats was astounding. Equally, all the older ones wanted to see my pictures of the newborn mice (pretty gross with no hair! ), and all ages enjoyed trying to figure out what the photo of e.coli was. 3. As soon as you ask a question, they all raise their hands to answer it. Not sure when this stops, but I know that by the time I was in high school the teachers had a hard time prying any answers out of the majority of us! 😉 However, on Monday I was at a school where the eldest was 11, and they all wanted to contribute. So, ask them questions. I found there were two types: the question where I wanted to get an answer (such as “What traits make a good horse?” or “What do you think makes these two cats different?”) and the type where I just wanted them to feel included in the talk, and just wanted a show of hands (such as “How many of you have a cat?” or “Who has heard of diabetes?”). 4. Introduce some ethics, and show how scientists think very carefully before doing research. We talked about genes a lot, and how putting new genes in bugs like e.coli can help us, e.g. the human insulin gene into e.coli to help with diabetes. I told all the older kids that it wasn’t the tool that is a problem: a tool is neither good nor evil. It’s how that tool is used, and people need to make a fresh decision, and think about the benefits and downsides each time that tool is used. I said genetic modification is like a knife: it is neither good nor bad, and that scientists try very hard to make sure that it is used for the right reasons, and in a safe way. 5. Visually-arresting analogies. Even though DNA is a double-helix and not a spiral staircase, I found it a very useful analogy, especially for the younger ones. 6. My partnered teacher had prepared some slides to show the kids prior to my arrival. They dealt with Mr. Green Genes, the GFP-glowing cat. Some of the other teachers also talked to their kids about inheriting some of your traits from your mom, and some from your dad, and used the labradoodle as a visual aid. This prepped them for my talk, which I think was really helpful. 7. Make your talk inclusive. It keeps their interest, I think. When I showed pictures of cats, I included one picture of my own cat, and told them a little about her. I often asked them questions about if they had pets, or scientists in the family, or liked the look of a picture, or knew what something was. These are probably things that most people are well aware of, however, I thought I’d just share my experiences! 1. How many of them knew the word “bacteria” before I could even say it. It was, strangely enough, the top answer to my “What do you think this is?” question when I showed them the picture of e.coli. 2. How many of the kids, without prompting, came up to me after my talks and said that they really enjoyed it. 3. How many came up to me after my talks to ask more questions, or tell me about a scientist in the family. 4. How much enjoyment I got out of giving my talks, and from listening to what the kids had to say. 5. One of the kids made an immediate connection between adding “glowing genes” (GFP etc) to fish, and Jurassic Park. Ok, so it isn’t an exact analogy, but that was really great to hear. It also brought forth a discussion, led by the kids, about saving endangered animals. And, in one direct appeal to my vanity, a little 5 or 6 year old girl told me as I was leaving her class that she thought I was pretty! Wow, what a nice way to finish a talk, and it definitely helped the ego 😉 I thanked her, and the teacher heard her and told her that her house could have a point. Then I realized that their school, just like Hogwart’s, had houses that got points! Too cool 🙂 And finally, a very great compliment from the teacher I’m paired with: “the kids are so much more enthusiastic about science and a lot of them have asked when you are comming back! Your work was perfectly pitched to the children’s needs and was explained in a way that was so easy to understand.” Thanks! I highly recommend the Teacher Scientist Network. If you are interested in registering with the Teacher Scientist Network in my area (operated by Science Learning Centre North East), please visit and register at http://www.slcne.org.uk/tsn as a scientist. Claire Willis will then receive your application and arrange a mutually convenient time to meet up. If you’re interested, but aren’t sure where to go for your area, then have a look at that page – you can send questions to Claire from there. that website also has more information about the TSN. They don’t ask for very much time from scientists at all, from a day or two per year, to anything that the teacher and scientist agree to. In my case, the head of my Centre told all of us employees that if we wanted to volunteer for the TSN, we could do, and do it on work time. He is most generous, and definitely sees the benefit of science outreach to schools. Author Allyson ListerPosted on November 7, 2008 June 10, 2009 Categories CISBAN, OutreachTags animals, biology, key stage 1, key stage 2, ks1, ks2, public engagement, science, science learning centre, teacher scientist network, teaching2 Comments on Scientist Meets Small Children, and doesn’t stop talking (and listening) all day!